Tulips, windmills, dikes and the masterpieces of the golden age: This article introduces you to eight essential excursions in The Netherlands. Your Dutch trip is not complete without these eight! 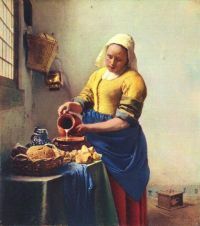 The Rijksmuseum in Amsterdam houses some of the greatest masterpieces of the Dutch golden age, including Rembrandt's Night watch and Jewish bride, Little street and The milk maid by Vermeer, and The feast of St. Nicholas and The merry family by Jan Steen. The Rijksmuseum has a lot more to offer than golden age masterpieces. Visit their website for details. Holland is windmills. There are almost a thousand of them left, most of them in the provinces Noord-Holland, Zuid-Holland and Utrecht. When travelling through these three provinces, you will see windmills everywhere. 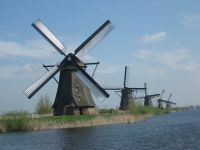 Still, a visit to the group of nineteen windmills at Kinderdijk (a village just outside Rotterdam) will be one of the highlights of your Dutch visit. Kinderdijk is a Unesco World Heritage site since 1997. The Keukenhof is a flower park with visitor centre in the heart of the so-called bollenstreek (bulb region), the region famous for its flower agriculture. 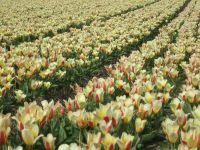 In April, the blue, yellow, pink, purple and red fields with tulips, daffodils and hyacinths are a spectacular sight. The Keukenhof is well worth a visit, but it has become a tourist trap. A more leisurely (and cheaper) way to enjoy the flowers is by touring the area. You can do it by car, but better by bicycle. Rent a bicycle in Haarlem, then head south along the canal Haarlemse Trekvaart until Voorhout, than go north again via the villages Sassenheim, Lisse and Hillegom. The bulb fields around Zijpe are less well known, but just as spectacular. The flowers bloom around April. Canal buses, canal bikes, pizza cruises, cocktail cruises, candlelight cruises: There are many ways to enjoy the famous Amsterdam canals. Traditional canal cruises start at several places in Amsterdam. For other canal events, booking is usually required - have a look at the offerings of companies like the Canal Company, Aemstelland or Kooij. 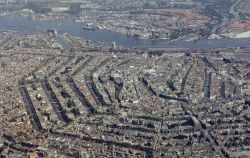 Most canals originated in the 17th century, the Dutch golden age. They were used for transport: Many canals are still lined with warehouses built in the golden age. The (daily) Amsterdam flower market is floating on one of the canals - a relic from the time goods (including flowers) were brought in by barges. For more information see the Amsterdam heritage site. The Binnenhof (litt. Inner court) is a court in the centre of The Hague, home to the Dutch parliament. 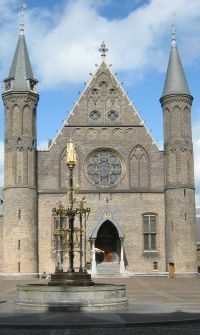 The Binnenhof is dominated by the Ridderzaal (Hall of Knights). The Ridderzaal was once build as a palace for the mediaeval counts of Holland. Today, it is mainly used for representative functions, like the opening of the parliamentary year by the Queen, or the reception of foreign dignitaries. Around the Binnenhof is a mix of ancient and modern buildings. Most of them are offices and meeting rooms used by parliament. Just outside the Binnenhof is the Torentje (Little Tower), the office of the prime minister. His department is also housed at the Binnenhof. The Binnenhof is (usually) open to the public, but as the area is in use by the parliament, the prime minister and sometimes the queen, it will occasionally be closed (sometimes without notice). Guided tours are available to some of the buildings, including the Ridderzaal. If you have not seen enough golden age masterpieces in the Rijksmuseum, you will find more of them in the Royal Picture Gallery in the Mauritshuis in The Hague. 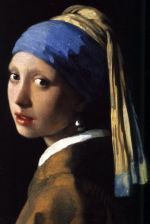 The girl with a pearl earring (Johannes Vermeer), for example. Or the laughing boy by Frans Hals. Rembrandt's anatomy lesson. Paulus Potter's bull. Vermeer's view of Delft. Fabritius' goldfinch. And many, many more. The Mauritshuis, the building that now houses the Royal Picture Gallery, is an architectural golden age masterpiece. It was built by the famous Dutch architects Jacob van Campen (architect of the Amsterdam town hall, now royal palace) and Pieter Post (architect of Huis ten Bosch in The Hague, now the residence of the Dutch Queen), for Count Johan Maurits of Nassau-Siegen. Johan Maurits was governor of the Dutch colony in Brazil from 1636 to 1644. 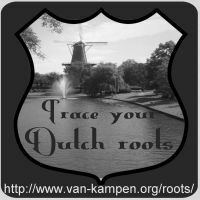 A recurring theme in Dutch history is the fight against water. A large part of the country is below sea level, protected against the sea and rivers by dikes and dunes. In the winter of 1953 this protection proved insufficient. During a combination of spring-tide and a northwestern storm, the dikes broke at several places in the southwest of the country, inundating 1750 sq.km. (675 sq. mi.). Over 1800 people were killed. The 1953 flooding disaster triggered an ambitious project: The deltawerken (delta works). It is a combination of dikes, dams, sleuces and storm barriers. Several river mouths have been closed off completely. The Eastern Schelde was also scheduled to be closed, but the environment and the fishing industry would suffer too much. Instead, an open barrier was built that maintained the tidal movement, and therefore protected the unique marine environment from the Eastern Schelde. It has 62 openings, each 40 metres wide, and can be closed during spring-tide. The deltawerken took over 30 years to complete. The last part (the Eastern Schelde barrier) was opened in 1986. The Anne Frank House, the hiding place in Amsterdam where Anne Frank wrote her diary , is now a museum. You can visit the secret annex where the Frank family was hidden. The museum also houses an impressive collection of Anne Frank memorabilia, many of them collected by her father Otto Frank, who was the only family member who survived the holocaust. Did you visit any of the mentioned attractions? What did you think of it? Let us know and leave a message in the guestbook.